To access the billing information for your SnapPages account, click 'Billing' from under the 'Settings' tab. From there, you will be taken to the 'Billing Settings' page. If you need to update the payment method for your account, click 'Add Payment Method' under the 'Payment Methods' section. From there, follow the steps to add the credit/debit card or PayPal account. As a note, when you add a new payment method it WILL NOT automatically become the new default payment method. To replace the previous payment method on file with the new one, scroll over the payment method you just added and click 'Make Default'. Once you've changed this, the new credit card or PayPal account you've added will be used to bill you for any future subscription renewals or other charges. If you'd like to remove an old payment method, scroll over the payment method and click 'Remove'. To view the billing history for your website, scroll down to the 'Billing History' section. 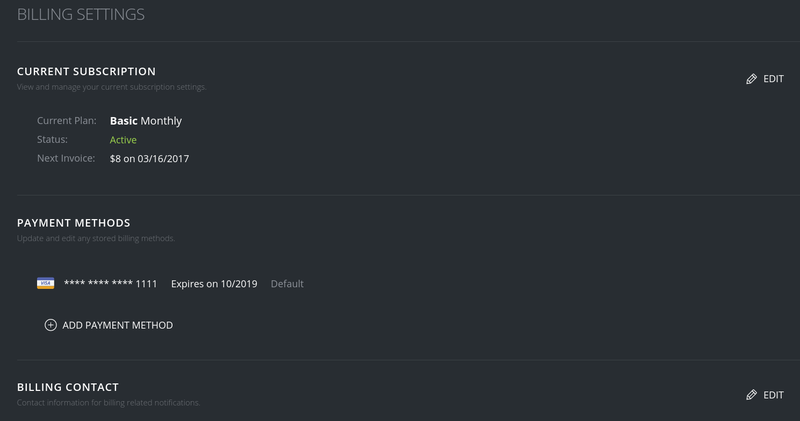 Any charges that have been made for your account should be displayed here. To obtain a receipt for any of the transactions, simply scroll over the charge, click it, and then click 'Email Receipt'. If you have any questions about charges that have been made to your account, please contact our support team. Please be sure to include the 'Transaction ID' when contacting us about a specific transaction. If the billing contact for your SnapPages account changes (name and/or email address), it's important to update your SnapPages billing settings to reflect these changes. If you do not have to up to date contact information listed in the billing section, you may not be notified about renewals, declined payments, or other important billing information. To update the billing contact for your account, just click 'Edit' under the 'Billing Contact' section. 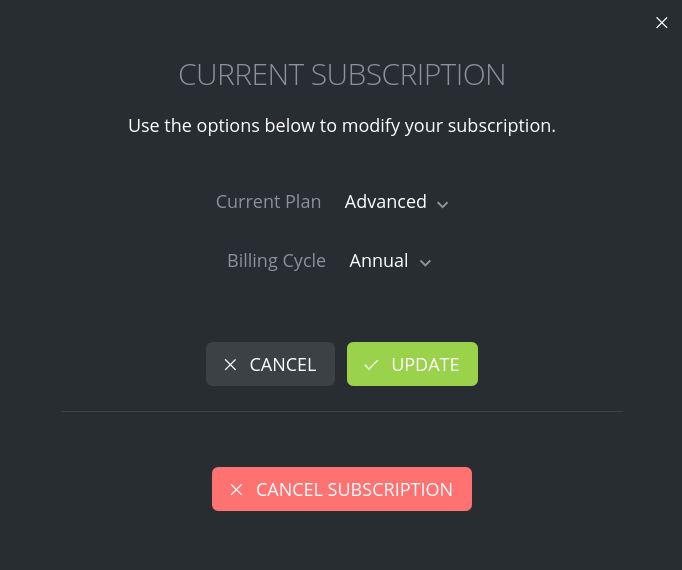 If you would like to cancel your subscription, click 'Edit' next to 'Current Subscription' and then click 'Cancel Subscription'. From there, follow the steps provided to request a cancellation of your services.